The summer of 2012 will go down in history as one of the hottest and driest summers on record. Data recorded by the National Weather Service in Springfield, Missouri at West Plains Regional Airport reported only 6/10 of an inch of rain in the month of July. A number of Howell-Oregon Electric Cooperative (HOEC) members in Oregon and Shannon counties have notified the cooperative of automated phone calls they have received claiming electric rates would be increasing 14.4%. HOEC has determined that the automated phone calls are regarding a proposed rate increase by an investor owned utility, Ameren UE, based in St. Louis. Howell-Oregon Electric Cooperative (HOEC) is committed to electrical safety; this commitment extends to the communities served by the cooperative. Recently, HOEC hosted Pike Energy Solutions at the HOEC facility to conduct a live electric line safety demonstration using 7,200 volts of energy. 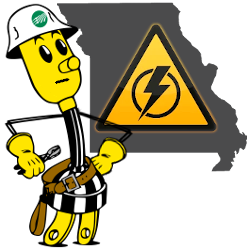 After severe thunderstorms packing 60 mile per hour winds swept through south-central Missouri the morning of Monday, June 11, Howell-Oregon Electric Cooperative (HOEC) crews were faced with power outages in a widespread area. The 73rd Annual Meeting of Howell-Oregon Electric Cooperative was held May 4th, 2012 at the West Plains Civic Center where approximately 750 were in attendance. Annual Meeting: now with more fun for kids! Howell-Oregon Electric Cooperative invites you to the 73rd annual meeting of membership Friday May 4th at the West Plains Civic Center. Bring the kids for a chance to win a bicycle, to get a picture with Buddy Bear, and to play in the all new Children’s Fun Zone that will be open from 5 to 6:30! Read more about Annual Meeting: now with more fun for kids! Howell-Oregon Electric Cooperative (HOEC) recently completed a major upgrade of service in a large area of Oregon County starting at the Junction of Y Highway and Highway 160 and all points south of there to Myrtle and then continuing east. The system improvements made will ensure continued reliability of service to Cooperative members in that area. Howell-Oregon Electric Cooperative's 73rd Annual Meeting of membership will be held Friday, May 4th 2012 at the West Plains Civic Center. The evening’s entertainment will be provided by the historic Palmetto State Quartet from Greenville, South Carolina.